MainAll NewsUS & CanadaIvanka, Kushner to represent Trump at embassy opening? Ivanka, Kushner to represent Trump at embassy opening? President Trump's daughter, son-in-law reportedly considering representing Trump admin at opening of US embassy in Jerusalem. Will President Donald Trump’s daughter Ivanka and her husband Jared Kushner attend the opening of the new US embassy in Jerusalem? 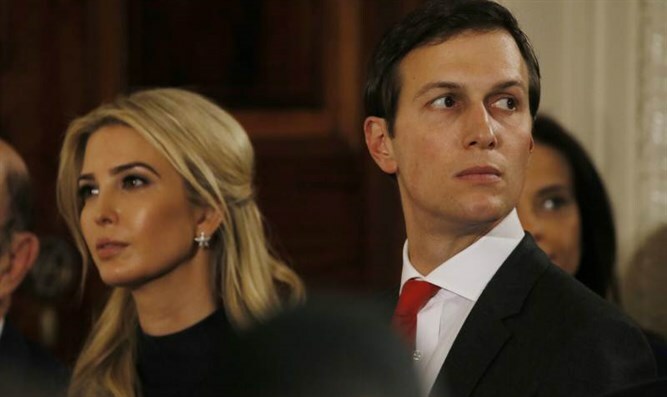 According to a report carried by The Times of Israel Wednesday afternoon, the president’s Orthodox Jewish daughter and son-in-law are considering flying to Israel next month to represent the Trump administration at the May 14th unveiling of the US embassy in Jerusalem. President Trump vowed on December 6th to relocate the US embassy from its present location in Tel Aviv to the Israeli capital, fulfilling a campaign promise to implement the 1995 Jerusalem Embassy Act, which requires the State Department to transfer the US mission in Israel to Jerusalem. While the couple is considering participating in the unveiling ceremony, no final decision has yet been made. The US embassy is expected to be transferred to Jerusalem in three stages. On May 14th – Israel’s 70th Independence Day – the US will open an interim embassy facility in the Arnona neighborhood of Jerusalem, converting what is currently used as a US consulate into a temporary embassy. The embassy will initially house the US Ambassador’s office, and a small portion of the staff currently located at the embassy in Tel Aviv. The Arnona compound will be expanded, with the addition of a new annex, likely by the end of 2019. State Department officials are also planning for the construction of a new embassy in Jerusalem to replace the interim facility at Arnona, though this third step is expected to take years to complete.